Diet and Nutrition is the foundation of health combined with fresh water, rest, work, love and play. However, this backbone of a health program often needs extra nutrients in various doses for their specific healing properties. Supplements do not replace a healthy diet. They only supplement it. 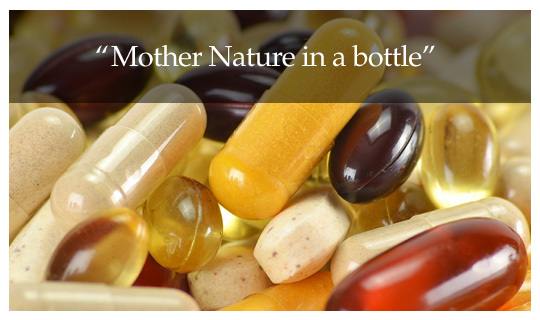 Many professional grade supplements are truly medicines; hence the name nutraceuticals. Family medicine-trained Dr. Adrian will recommend a specific program that takes into consideration what you have been taking, your diet, current health and medical problems. We sell over 300 professional quality nutraceuticals and food items in our office and on our website DrAdrianMD.com. Our selection of natural health products is ever expanding as we see new needs or new products that are of value. Products may be purchased in person at our office , via mail order or our website. Remember, do not overdo supplements. "More is not better" applies to diet and nutrients as well. This is especially the case for multivitamins and minerals, and acidic nutrients. Consult Dr. Adrian on the individual products for more information. If you are looking for high quality professional grade supplements and vitamins with certified potency, come see us! We have satisfied customers who come to our alternative medicine doctor from Harrisburg, Hershey, Lancaster, Palmyra, York, Elizabethtown, Annville, Chambersburg, Hummelstown and Reading, PA. We always discount our products and pass along our saving to you.